In 1657, John Owen produced one of his finest devotional treatrises: probably originating from the substance of a series of sermons. 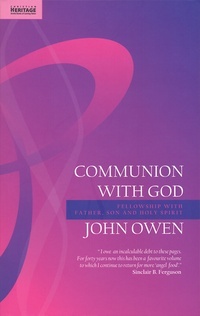 He examines the Christian’s communion with God as it relates to all three members of the trinity. He assures that every Christian does have communion with God, no-one is excluded and that this communion takes place distinctly with Father, Son and Holy Spirit. This was a controversial work in ecclesiastical circles of the 17th century. Twenty years after its publication, the rational ecclesiastical elite were scoffing at it’s contents. Owen strongly defended the ideas within this book, and history has shown him to be right! It is a classic of Christian devotional thought that still influences the church today. This is the orginal text with a new layout and is fully subtitled which makes it more accessible to a new generation of readers.